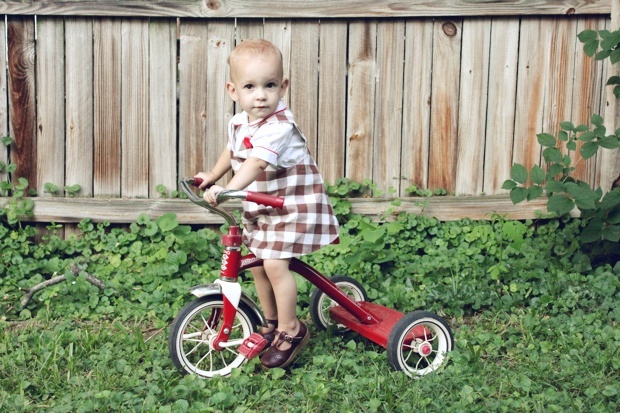 Earlier this week Rubyellen posted photos of her girls in their backyard for our weekly VH,VT. I wish I could say I decided to follow suit but it seems our backyard has been the backdrop for far too many outfit posts already. It's so handy, though! I recently spent an hour trimming branches and cutting down random baby trees so there would be enough fence showing for a decent background. I hope you can't see the mosquitos in these photos! I found this patterned skirt last week and loved the print. I thought about hemming it and wearing it as a skirt to my knees until I realized it might work double duty if I left it alone. It has elastic on the back half of the skirt so it worked to wear it over a tank top as a belted dress. Then I tried it with the same tank top, belt, and shoes and mostly liked it. I think the shoulders need a bit more sun, though! I've not been a skirt girl since I was pregnant with Sebastian but Rubyellen has been enticing me to try them again with all of her beautiful outfit posts. I'm wearing: Vintage skirt, thrifted. Belt, thrifted. Tank top and shoes, Target. Cardigan, Wal-Mart. Necklace, gifted from Elsie from Sadie Designs. Ruby was pretty busy playing with her new puppy but I managed to lure her over to my manicured spot on the backyard fence with the red tricycle. I think she's about ready to take over ownership, folks! 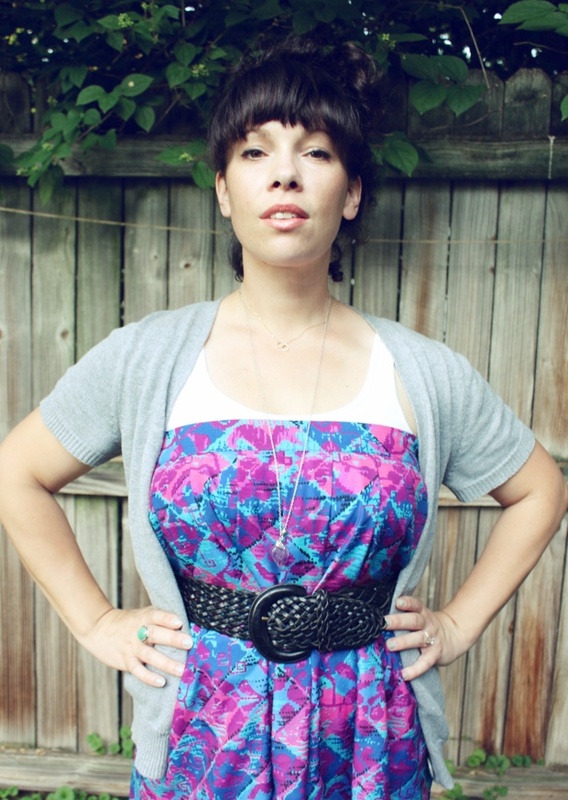 Ruby's wearing: Handmade smock from vintage fabric using vintage pattern. Vintage collared shirt. Thrifted bloomers. 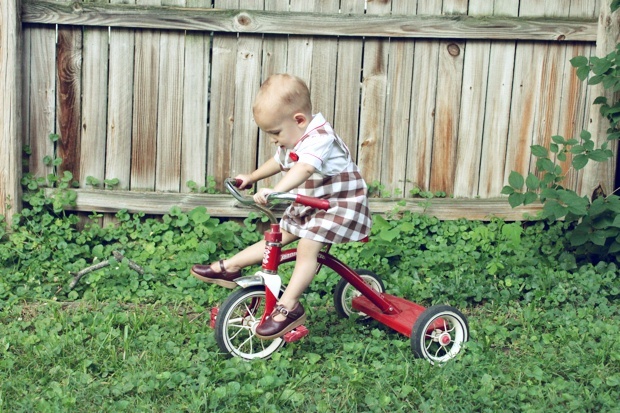 Vintage shoes from KidWonder. I realized recently that this weekly feature that we've been running for about eight months now (really?) has helped reshape the way I think about my wardrobe. I used to only really make an effort to get dressed up when I was going out with my friends. Wearing vintage used to feel like a habit I was trying on but now it feels like my style. Having a weekly reason to experiment with my wardrobe has helped me figure out what works and what doesn't and has offered another creative outlet in expressing myself. I still rock the cut off jeans and t-shirts and occassionally hope my cute dress will distract from the unwashed hair but vintage is here to stay. Brett and Sebastian have both recently complimented me on how pretty they thought I looked when I wore dresses. That's all I need, folks! I love that Vintage Here, Vintage There has allowed me to get to know Rubyellen and her sweet family in a fun way and provided a way to enjoy this part of my life with so many readers with the same itch. It's been a fun way to document Ruby's growth and will be a special collection of photos someday. I've gotten a bit sentimental this week! Our thanks to all of your sweet compliments and shared links each and every week. You guys make this even more fun! 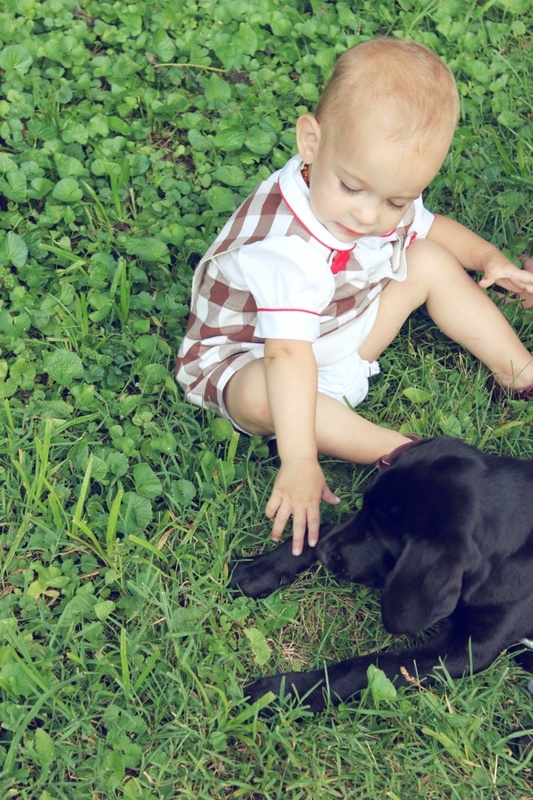 Head over to Rubyellen's post if you haven't already seen what they wore in their backyard last week.